When you have an all-terrain vehicle, there are bound to be repairs and replacements needed over time. Since this is a machine that sees a lot of jostles and rough terrains, the wheel bearings are bound to eventually take a hit and need some TLC. Let’s take a look at how to replace wheel hub bearings on your ATV. What are signs of damage to wheel bearings? Before you learn how to change the wheel hub bearings, you should probably know the signs that you need to in the first place. Since ATVs and UTVs ride through water and mud on a regular basis, it is natural for the wheel bearings to fill with water and mud. While most bearings are sealed, that doesn’t mean they are completely safe from taking on some damage over time. Since most people use a pressure washer to clean their wheels after a ride, they are also most likely forcing water and mud into the slit of the seal a little at a time. Wheel bearings are naturally bound to fail with most only lasting around 3-5 years. The signs of trouble related to your wheel hub bearing include a grinding noise, pulling to one side when stopping, wheel vibration, and an overall change in the way the vehicle rides or handles. Put the vehicle up on a jack. This will make it easier to work while ensuring safety. Remove the lower shock bolt and free the shock. This will give you a better range of motion in the suspension for better access to the hub. Remove the wheel and place it to the side. The wheel hub will most likely be secured with a large castle nut on the end of the axle as well what’s called a cotter pin through the castle nut. 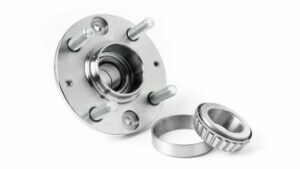 While you can remove and reuse these with your new wheel bearing hub, it is better to simply replace them at the same time as the hub since they are usually rather thin and can take on a lot of wear. Remove the axle nut and set aside. After removing the axle nut, the next step is to remove the brake caliper. The caliper will typically have two boots holding it in place. Simply loosen these bolts and pull the caliper off of the brake rotor. From there, you will be able to slide the wheel hub off the axle. Remove the steering tie rod from the knuckle of the suspension arms. This will make it easier to work on the wheel hub bearing. It will also give you more leverage over the smaller castle nut. Next, remove the wheel bearing knuckle from the suspension arms. Once you remove the knuckle, you can start removing the outer seals and actual bearings. If the seals are still intact inside the bearing, remove them. This will give you access to the bearing. You will usually have to tap the sides of the bearing from side to side in order to get them out. This can take a while but it’s an effective method. The goal is to tap it with even pressure on both sides, so it stays lined up and you can eventually pull it out. Once you have removed the old bearings, you should clean the knuckle before placing the new bearings. When installing the bearing after that, you can use a socket wrench that fits the bearing but be careful not to tap or hit the inner race of the bearing because it might weaken it. The new seals should be placed where the old seals were and should sit at the outer edge of the knuckle. Don’t forget to install spaces between the bearings if that’s part of your design set up. Once you have the bearings, seals, and spacers in place, you simply work backward from where you started and replace the parts you removed such as the knuckle, steering tie rod, axle nut, and so on until the wheel hub area is completely reassembled as it was before.